One of the highlights of recent WorldTour seasons has been the development of the LottoNL-Jumbo sprint train with the team’s main man, Dylan Groenewegen, emerging as one of the world’s most feared sprinters. Take Stage 7 of the 2018 Tour de France. In the longest stage of the race, the 25-year-old Dutch rider was perfectly positioned by Paul Martens, Amund Grondahl Jansen and, finally, Timo Roosen before choosing Alexander Kristoff’s wheel in the run-in, then coming around the Norwegian with 200m to take the win. It was a great show of power and skill to watch – but behind that display was planning and preparation. The sprint train is a complex beast where each rider has a specific role. First up, there’s the ‘controllers’, who determine whether to shut down a breakaway or let them go if it’s small in number and doesn’t include riders from the other teams in sprint contention. Then there’s the ‘positioners’, who’ll bring their team toward the front of the chasing pack and crank up the pace, taking 1km or 2km turns up front. With around 1.5km before the finish line, the ‘speed pilot’ takes charge. Next comes the ‘accelerator pilot’ to drive on again from 1km to 500m, before the ‘lead-out’ (Roosen) sprints from around 500 or 600m. 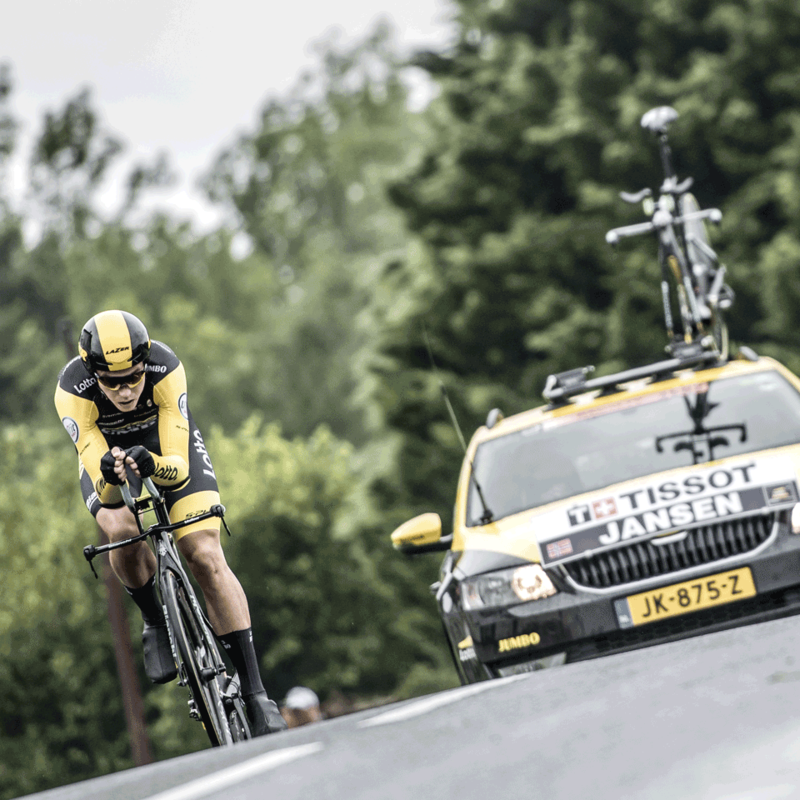 The sprinter (Groenewegen) then takes over from typically 200m out. The sprinter may grab the headlines but to do so he’s often the last link in a well oiled chain. What the fi’zi:k saddle-riding LottoNL-Jumbo team show us is textbook planning and execution but if you don’t happen to have an elite lead-out train to propel you to the line, there are still many things you can take from this most dynamic show of cycling skills. Primarily, it’s the training that underpins the performance. You’re looking to build explosive power alongside the endurance gained from Sunday morning rides. Hill sprints are ideal. Aim for four to eight efforts of 20-40 seconds each, all seated and all maximal. Shift into the biggest gear you can muster for these sprints, but change right down again for 5 minutes easy riding between each. You can also hit the track. It’s no coincidence that many top sprinters like Groenewegen spent much of their formative careers in a velodrome, the nature of track riding meaning a focus on high-intensity efforts that’ll pay off at the end of a road race. You can also have some fun with your roadie mates, sprinting to the next sign, for example, when traffic means it’s safe to do so. You should also hit the gym. As Groenewegen explained at February’s Volta ao Algarve, where he won two stages, ‘A key part of my training are squats.’ For many sprinters, these comprise heavy weights and low repetitions in the winter to build power output; come the summer, when racing’s more frequent, it’s lower weights and more repetitions to add sustainability to the sprints. Just remember that building sprint power puts your muscles under greater stress than endurance work, so protein intake is vital to accelerate muscle repair post-session. A quality carb-protein shake is ideal followed by a meal containing protein-heavy foods such as chicken and tuna. And if you really want to go all pro, slip into a pair of compression socks to clear out toxins. You might not match the speed of WorldTour sprinters like Groenewegen but whatever your size and experience, you can improve your top-end speed. This’ll pay off at every kind of race, from sportives to inner-city crits, and, more importantly, on training rides with your friends. While this year’s Vuelta a España may have fewer opportunities for sprinters than the first two Grand Tours of 2018, it’s the next great opportunity to watch the masters at work and get inspired.